Man to man under out inbound play. 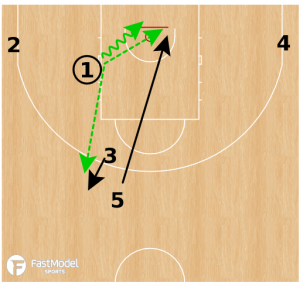 The play was contributed by Diccon Lloyd-Smeath to the FastModel Sports Basketball Plays and Drills Library. Diccon Lloyd-Smeath is based in London, England, and currently coaching at Reading Rockets as well as internationally with Basketball Wales and Basketball England’s U15 National Team as a Performance Analyst. He studied for an MSC in Basketball Coaching Science in a course split between the University of Worcester and the Lithuanian Sports University. While delivering team scouting reports for the Worcester Wolves in the BBL during his placement year, and spending time during the summer in Lithuania, Diccon developed a fascination for cutting edge Xs & Os, advanced stats, and elite coaching practice. Now producing basketball analysis and content for the FIBA Basketball Champions League, he is always learning, sharing and talking hoops. Nice BLOB from Spain Coach Sergio Scariolo. 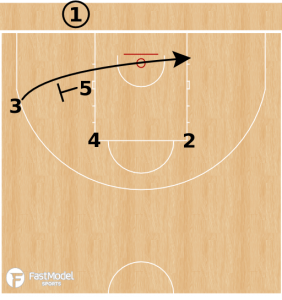 Staggered screen to inbound the ball, then “gut cut” (similar to a zipper cut but inside) from 1 through a down screen from 5. On the catch, 5 and 3 enter Spain PNR. Tough to guard with lots of movement and screening action. 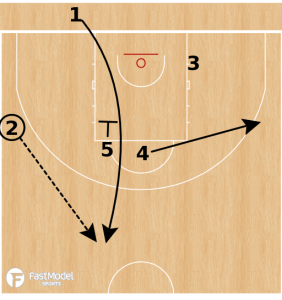 3 cuts off back screen from 5. This cut is to loosen 5’s defender more than to score. 5 then turns to set staggered screen with 4 for 2, who curls off to receive pass from 1. 1 makes gut cut up through paint. 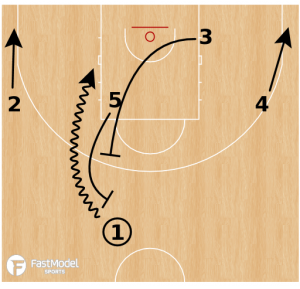 5 sets a down screen to help 1 to receive reversal pass from 2. 4 clears out to wing. 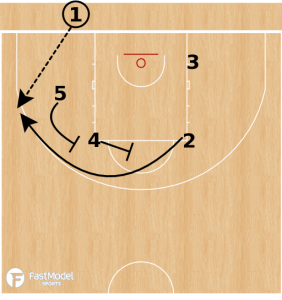 On catch, 5 and 3 set screens for Spain PNR. 2 and 4 fill the corners. 5 rolls, 3 pops and 1 makes best decison.